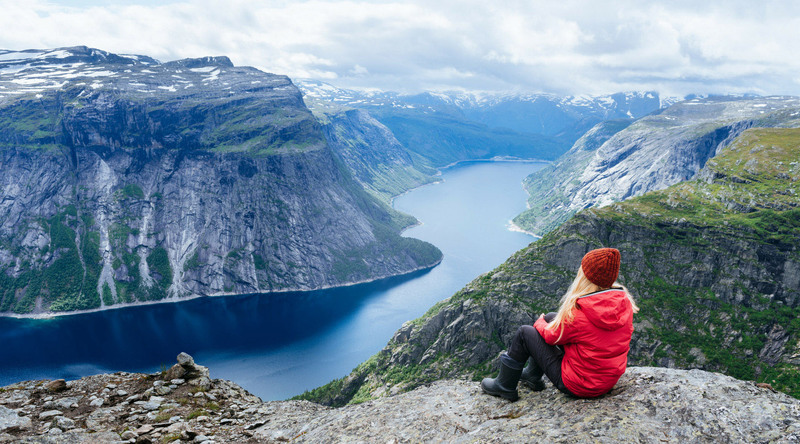 As a travel destination, Norway has a lot going for it. Cultured cities, a fascinating history, and delicious food are just a few of its draws. And yet, those attributes are overshadowed by one undeniable quality: it’s one of the most beautiful places you will ever see. The sights and sounds of Norway are simply stunning – ice-blue waterfalls plummeting down sheer cliffs, glassy, emerald glacial lakes reflecting the lush green forests that surround them, colorful wooden houses lining quaint waterfronts. Everywhere you turn, it’s a photo opp. We have lots of upcoming voyages calling on Norway. Will you be joining us for one? We certainly hope so! Here’s how to prepare before you set sail. When should I travel to Norway? You should visit Norway during the summer months of June through August. This is when temperatures will be mildest and scenery at its most lush. The days will be long – it’s this season that gives Norway its nickname of “the land of the midnight sun” – and locals will be out and about, enjoying outdoor activities during the day and long dinners into the night. Norway actually has a milder climate than other destinations along similar latitudes, thanks to the Gulf Stream. So don’t expect it to be as cold as, say, Alaska. Norway is a large country, though, and temperatures do vary among regions. In southern Norway (i.e., Oslo), temperatures during June, July, and August typically range from 55°F to 70°F. Farther north, in the fjords, you can expect temperatures during those same months to be in the range of 45°F to 60°F. Listen to the folks from Visit Norway, though, and expect the weather to change drastically day to day. With a climate that varies not only by region but by day (or even hour), we have two words when it comes to packing for a trip to Norway: Light. Layers. Where in Norway are you traveling? How long will you be vacationing? What kinds of activities will you be participating in during your trip? If you’re cruising to Norway with Azamara, then you’re going to be experiencing the whole country. And you’ll have a docket of exciting shore excursions planned. You might be kayaking glasslike fjords one day and enjoying a homemade feast at a local farm the next. You can also bike through the beautiful Norwegian countryside, sip a cocktail at an Arctic ice bar, hike alongside a pack of huskies, and more. You’ll need light, breathable, weather-resistant layers for all the outdoorsy excursions you’ll be enjoying in Norway. Start with a nice, lightweight jacket. The Houdini Jacket from Patagonia (they make them for men and women) won’t take up too much suitcase space and will keep you comfortable while exploring the fjords. Next, consider your base layers. Merino wool is great for warmth. This North Face long-sleeved tee for women or for men will keep you warm on chillier days. For warmer days, choose a shirt in a breathable, moisture-wicking fabric. Long sleeves will help protect you from the sun’s rays. Madewell’s whisper cotton long-sleeve crew neck tee for women fits the bill. Speaking of sun, you’ll need a hat to keep it off your face! What makes a good travel hat? A wide brim is key (again, sun protection) and it should be easily packable. A material that’s easily crushed or misshapen, like straw, will simply be a hassle. Tilley makes hats for men and women and includes a “travel” category on its website. If you plan to do any hiking in Norway, you’ll need some decent hiking shoes. Chances are you’ll just be doing day hikes, which means you’ll want a low-cut boot with a flexible sole. In this blog post, the staff from REI share their top picks for the best hiking boots. In addition to outdoor gear, you’ll want some basic travel-friendly clothes for exploring cities and towns. Think comfortable walking shoes, and light layers that you’d be comfortable wearing to a museum or restaurant. And don’t forget some fancier clothing for dinners and dancing onboard your Azamara ship! You can find some more general packing tips for your cruise here. Download this handy cruise packing checklist! Need a cheat sheet? Use this helpful packing infographic to help guide what you pack for a two-week cruise vacation.